Lakeland View Self-cateringOur properties in Romney Grange are justifiably popular and we are sure Lakeland View will be the venue for many happy visits for our clients. 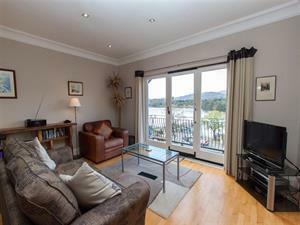 This rather special top floor apartment for two overlooks Lake Windermere at Waterhead with its ever-changing scene of boats at their moorings and the comings and goings on the steamer pier against a panoramic backdrop of fells and distant mountain tops. If you can tear yourself away from the view you will be delighted with the choice of restaurants, pubs, cafes and shops all within walking distance. Lake cruises begin across the road and there are numerous walks to be done from the door. Accommodation: Security entry system and access to the top floor by stairs or lift. Entrance hall leading through to the stylish open plan sitting/dining room and kitchen (32 inch HD TV with Freeview+, DVD, free Wi-Fi broadband, digital radio/cd player and ipod dock). Full height patio window opens out onto a balcony overlooking the lake. There is one double bedroom - again with beautiful views - and a well-appointed bathroom (shower over bath, basin and wc). The whole property has a light and stylish holiday feel. Much of the flooring is in oak with fitted carpet to the hall and bedroom. Electric off peak and panel heating keeps the well-insulated interior cosy year-round. Outside: Balcony with fine lake views. Shared gardens. Parking for one car in named space. Lake 50 yards, village centre half a mile. Linen includes towels. Telephone is pay as you talk. Children welcome from any age. Lakeland View offers weekly bookings starting on Saturday. All bed linen, towels and fuel included in rent.